We are pleased to present the following Lakota ceremonial recordings by David Swallow, Jr. David is a Teton Lakota wicasa wakan who was born and raised on the Pine Ridge Reservation in South Dakota. Wicasa wakan means "holy man" or as some would say, "medicine man". David Swallow's recordings are available for purchase from our main Matoska Trading Company, Inc. web site. The "purchase" links will take you to the appropriate page where you can listen to audio samples and complete your selection. "These songs are all prayer songs... you could sing these songs if you need prayers, or if you're down... or things bother you and things don't go your way. You could sing these songs... these sacred prayer songs... in the morning, or in the noon time, or in the evening, or at midnight... these four times are the most sacred times. If you sing from the heart, then Tunkasila will hear you and will help you." David Swallow Jr. is a Lakota spiritual leader in the Porcupine District of the Pine Ridge Reservation in South Dakota. On this recording he presents a series of prayer songs that can be used by anyone. They're sung in Lakota and David explains them in English. They are not always directly translated but explained more like a story. While listening to this CD, we felt we were having a personal lesson with David. A very good CD that helps you understand the Lakota way of seeing things. There are eight songs on the CD. The first eight tracks are the songs with David's explanations. The next eight tracks are the songs played without commentary. 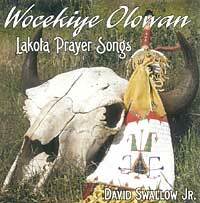 Includes a booklet with the Lakota words and English meanings for the songs. Inipi (sweat lodge) is an ancient ceremony used for purification and healing. Participants crawl into a small lodge and hot rocks are placed into a pit in the center. Water is sprinkled on the rocks, instantly turning into steam. Songs are sung and prayers are made to the Creator. David Swallow Jr. is a Lakota spiritual leader in the Porcupine District of the Pine Ridge Reservation in South Dakota. 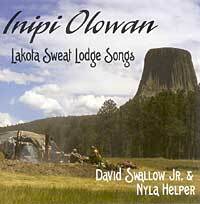 On this recording, he sings songs from rounds 1 through 4 of the Inipi ceremony with Nyla Helper. The songs are sung in Lakota and the CD includes an 8 page booklet with English translations. Note that there are introductions to the songs in English. The CD includes an 8-page booklet with the Lakota words to the songs and the English translations. Translations to other languages are below. Please note that that these translations have been contributed by various individuals and there may be other ways to convey meanings. As we are not fluent in any of these languages, we are accepting them as provided to us. If you feel there are mistakes or if you have improvements, please do submit them to us for consideration. Additionally, if you are capable of providing translations to languages not listed here, we would be pleased to add them. Copyright ©2005-2007 Matoska Trading Company, Inc.